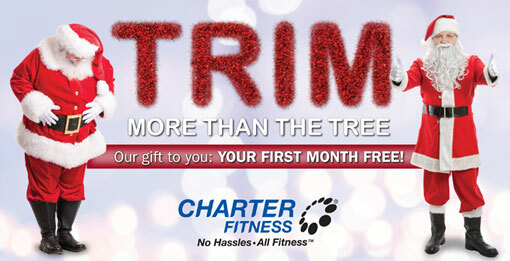 Join Charter Fitness today and get your first month free! Join today for just $10 a month, and experience all that we have to offer – including state-of-the-art equipment, knowledgeable staff and trainers, and Personal and TEAM Training opportunities. This offer won’t last long, so come check out our awesome amenities today. Hurry, this offer expires December 21, 2017. Expires 12/21/17. Valid at participating Charter Fitness locations only. Other fees and restrictions may apply. See store for details. © Charter Fitness Inc. 2017. All rights reserved.